I already wrote a note once for this strip, but it seems to have disappeared. As I recall, it was about the history of the characters. Fuzzball and Scuzzball first appeared in 1986--the same year as Watchmen, Dark Knight Returns, and Maus, so clearly a big year for comics--in the pages of Messy Comics #2. This self-published venture was written and drawn by Mr. D.F. French, and was distributed throughout Mrs. Watkins' 5th grade classroom. 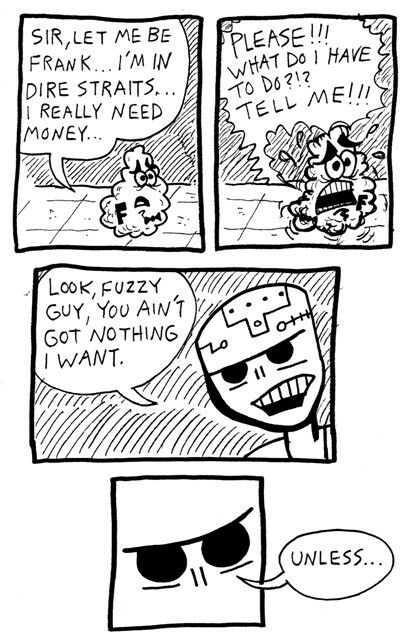 Sadly, that comic is lost to history, but Fuzzball and Scuzzball's second appearance, in the one page "The V-Day Card Caper! ", is still extant.